Do you also love brownies? But do you fear they might be unhealthy, high in sugar and fat? Don’t worry, because I am going to present you these healthy gluten-free vegan sweet potato brownies. They are fudgy, moist, rich, gooey, chocolatey and delicious. Sounds interesting to you? If yes, continue reading. They are furthermore healthy as they contain sweet potatoes as the main ingredient! Yes sweet potatoes, Japanese (white) ones to be exact. If you can only find orange sweet potatoes where you live, you need to add a little bit more flour, otherwise, they will end up too moist, since the white sweet potatoes are more starchy. But don’t worry they will still taste amazing! You can use sunflower seeds or other seeds/ground nuts instead of hemp seeds. I love the flavor of hemp seeds though, furthermore, they are very healthy, rich in protein and omega 3 fatty acids. 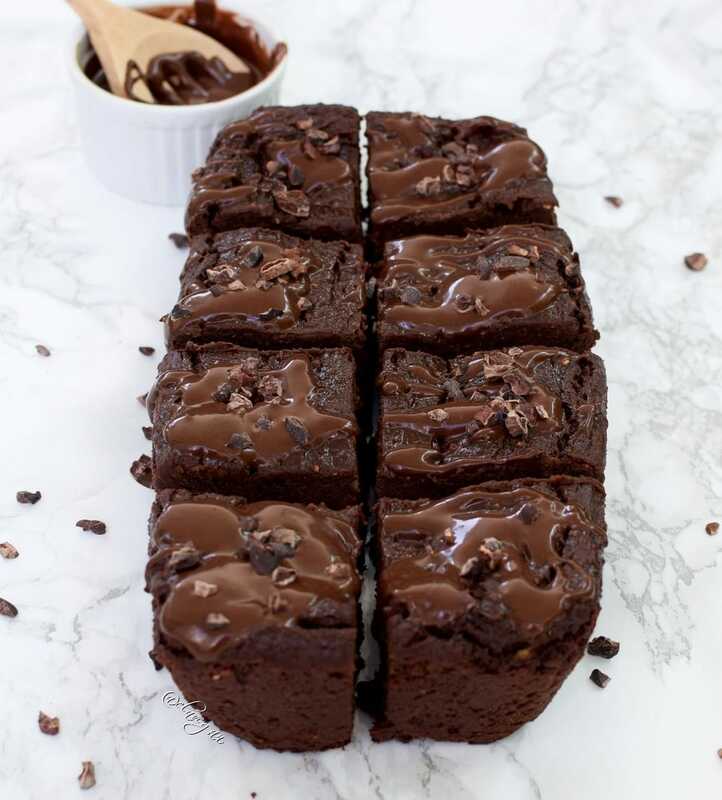 Top these fudgy brownies with a chocolate sauce made from peanut flour, cocoa powder, maple syrup and water and you end up with a heavenly chocolate spread. Find the exact recipe for the chocolate sauce here or here. I must admit that the brownie batter was a little bit sticky due to the sweet potatoes BUT I would still make this recipe over and over again since the result was extremely delicious. You might have seen these vegan sweet potato brownies before because I posted them already twice on my Instagram account @elavegan and people went totally crazy about them. They were reposted on big accounts like @beautifulcuisines and @vegancommunity and I was even tagged in numerous remakes. Everyone enjoyed my recipe, let me know if you also give it a try. 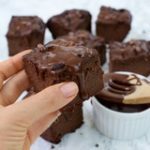 If you are looking for a protein-rich brownie recipe, which is also vegan and gluten-free, then check out my best vegan brownies. Process the xylitol (or coconut sugar) in a coffee grinder or food processor until it becomes a fine powder. Repeat this step with the hemp seeds (or use ground almonds instead). Put all ingredients in your food processor and blend until you have a smooth batter. Pour in your brownie mold (I used a silicone mold 8.5" x 4" resp. 21.5 cm x 10 cm). Bake in the oven at 350 degrees F / 180 degrees C for about 40 minutes or until a toothpick comes out almost clean (should not be sticky but also not too dry). Let it cool for 20-30 minutes. 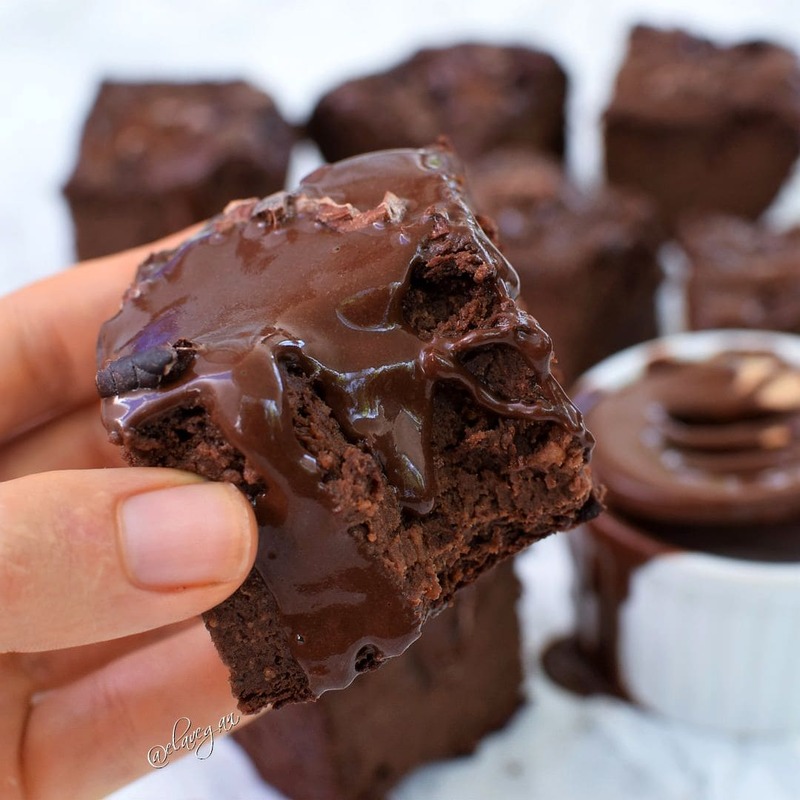 Top these fudgy brownies with a vegan chocolate sauce. 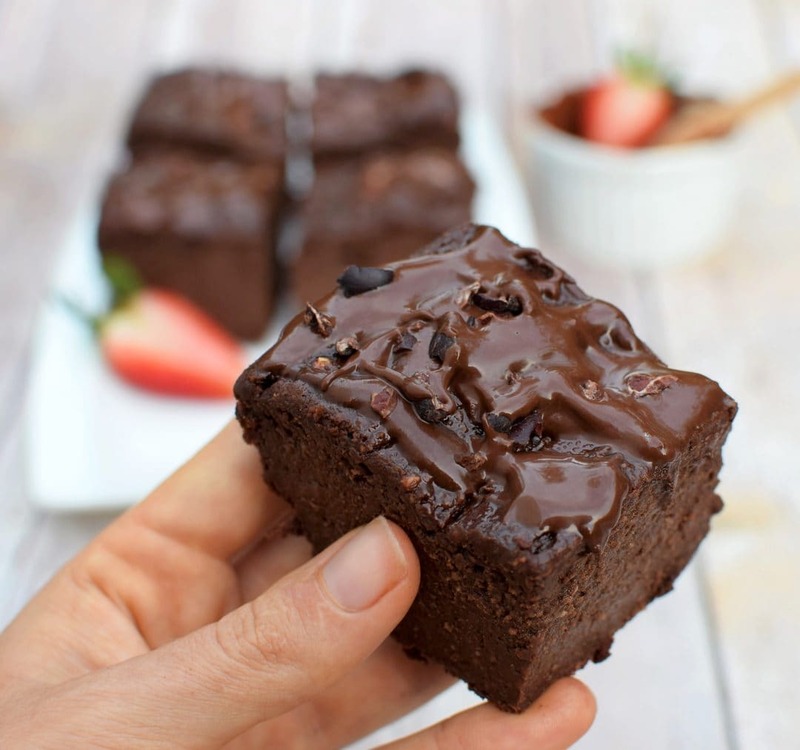 You can find the exact recipe here PS: The brownies are even better on day 2! If you don't have white (Japanese) sweet potatoes, you can use orange ones. However, you should increase the amount of flour (e.g. 1 1/2 - 2 cups) if you use orange sweet potatoes. Most amazing brownie recipe ever! Also great treat to have in between meals ???? How’d you make the chocolate syrup that’s on top??? These look amazing, definetly want to try making a batch this weekend. What is the icing drizzle made up of please? This recipe is the best! Highly recommend to try it! Very easy, I make them quite often ???? and they make such a healthy dessert!! Thank you for this recipe, Ela! ???? It depends, the dough shouldn’t be too thin but also not too thick. I would say maybe 1/4 to 1/3 cup more flour. Please try it out and report back. Adding 1/3 more flour resulted in a really heavy brownie.???? Well I assume the brownie batter was too thick with 1/3 cup more flour, 1/4 cup would have been probably better. I made the recipe numerous times with the white Japanese sweet poptatoes and it always turned out great. Any modifications to my original recipe will of course alter the result. Once I get my hands on orange sweet potatoes I will make it again with 1/4 cup more flour and update the recipe notes. of seed? I have an allergy to sunflower and don’t have any hemp. Chia or flax or anything else? Hi this recipe sounds delicious. I just wanted to know if you had to use cacao powder or can I just use dark cocoa power. Hi! Can I use something other than oats such as tapioca.or arrowroot flour? If so do you have a recommended amount? Thank you!!!!! I absolutely love these brownies. I ate 3 last night….. so adictive. I made one change (only because I am allergic). I substituted apples for the bananas. Thanks for posting these on IG Ela! These sound amazing, and I definitely want to try them! I was planning on substituting tapioca for the oats and noticed you recommend against this. Can you please elaborate on the concern of substituting starches? Will it affect the consistency, taste, or is it just because it will have more starch vs protein than the original recipe? Hi Nora, I think it’s ok to sub tapioca for other starches but I wouldn’t recommend to sub tapioca for oat flour or any other flour as it might affect the consistency. You probably could sub oats with buckwheat or sorghum flour, also almond flour might work (I never tried it though). You can try out different versions however I always recommend to follow the recipe as this is what I did many times and the result was good. Hope this helps. Thank you, Ela, that was very helpful! I will look for oat or one of the other flours you mentioned. Is it 450g of sweet potato before or after cooking please? Thanks Ela for your speedy reply. I ended up using a square tin I found which I lined with oiled paper. Unfotunately i think it burnt a bit; my fan forced oven seems a bit quick. But when I try it on the weekend I’ll let you know how it went. If i get time I’m thinking of making a chocolate frosting with chocolate chips, coconut oil & vanilla. I can’t make yours as I’m allergic to peanuts and the workshop site I’m going to is nut free. If you put aside the baking powder, you do not need to cook. I will try without cooking because all the ingredients can be consumed like they are, except potato, but it is boiled already. Did you tried? I like your blog. Congrats for your good work you do! I never tried Cassava flour, so I really have no idea how it will turn out. If you try it out, please report back! Are you allowed to eat coconut flour? This might work too (I wouldn’t use more than 1 cup though). What are your thoughts on making without sugar? Or is it pretty pointless to do so? And I don’t want to sub with maple syrup, honey, etc. Ela, How about dates? Do you you think that using them instead of Xylitol will work? And what amount would you recommend? Thank you for your work!???? Such a healthy and delicious dessert! I highly recommend trying this recipe! ???????????? Ela, thank you for sharing this recipe with us. Hi… I tried this amazing recipes today stil baking. Will be amazing if you add some pictures more for unprofi) not all of specs but thickness and some more important details. Thank you Ela for this amazing inspiration so even me baking ???????????????????????????????????????????? I cannot wait to try this recipe!! I’m so happy I found it :). I have a question :). Is the 450g boiled sweet potato without skin? Aren’t boiled potatoes a little too wet? Hi Ela! Do you put the sweet potatoes raw like the bananas in the mix? I am going to try this recipe. Looks delicious!! Thanks so much for your amazing feedback! I am super happy you liked my recipe. ???? OMG! These are amazing! So delicious! Thank you for the recipe! I made them for my daughter’s bring your food party at school. ???? Oh, forgot to ask; do I need to keep them in the fridge? I just found your recipe and it sounds so delicious ???? the only problem is: I’m allergic to bananas… is there an alternative? The brownies are very VERY delicious! I used the orange sweet potatoes and I added a bit more of oat flour. I used the coconut sugar but next time I will make them with the brown one. 2. The blender (I have a Blendtec) didn’t blend — had to mash by hand. 3. They definitely didn’t need that much sugar. I added 3 tablespoons and it was delicious. And more than enough! Are you sure though about the size is the mold? I followed the instruction with all the quantity of the ingredients and I got a ton of batter (which is good)! I had to use 21 x 21 (cm) square mold and it was just about the right size. Anyway my brownie is still in the oven and can’t wait to taste it! Just made these and they are Delius, thank you. Do you know if you can freeze them/ how long they last unfrozen? How would it taste without any sugar? Probably not good because of the cocoa powder which is bitter. These were delicious! My boyfriend and I devoured them!